Chances are, your first experience with an Indian dessert was tasting a lot of deep-fried flour and sugar. November 13 is Diwali, the Hindu festival of lights and an annual celebration of good conquering evil. On this day, Hindus, Sikhs, Jains and members of other religions take the day to remember the significance of the Hindu God Lord Rama coming home after being exiled for 14 years. And like any festive holiday, people celebrating Diwali also squeeze in as much family time and food as they can. Indian sweets or mithai are served as both a religious offering and celebratory dessert. And they're usually, well, sweet. Mixed with flour, sugar and often milk products, sweets are flavoured with traditional toppings like pistachios, almonds and saffron. Other traditional activities include lighting small tealights called diyas around the house for a week and visiting a temple for blessings. Most holidays mean we temporarily abstain from our diets, because you can't fully celebrate all festivities without indulging in some sugar. For Diwali, popular Indian desserts include jalebi, which is a deep-fried swirly dough, drenched in sugar syrup and orange food colouring and gulab jamun, which is deep-fried dough balls also drenched in sugar syrup. But don't be fooled — Indian desserts may be oily and sugary, but the Indian diet is one of the most healthiest in the world. A typical Indian diet includes whole grains, fruits, vegetables, legumes, nuts and sugar-free yogurt, according to LiveStrong.com. Most Indian dishes are created from scratch, avoiding any preservatives or added sugars, and turmeric, used extensively in Indian cooking, has been closely linked to protecting against Alzheimer's disease. Taking our own spin on some of these popular desserts, we've also added a calorie count and a simple (most of the time) exercise that can burn off that deep-fried sugary treat. Happy Diwali! THE DISH: Gulab Jamun is a popular Indian dessert made with fried dough and milk. Rolled into balls, the dough is then chilled in sugar syrup. CALORIE COUNT: Two balls have about 387 calories. BURN IT: Jumping rope for 43 minutes will help burn about 400 calories, according to LiveStrong.com. 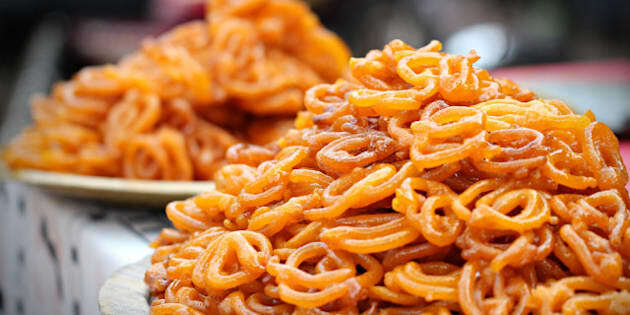 THE DISH: Keeping with the trend of deep-fried goodness, jalebi is also fried wheat flour (twisted into swirls or pretzel shapes) and dipped in sugar syrup. It gets its bright orange colour from food colouring. CALORIE COUNT: One piece is about 150 calories. BURN IT:Dancing for 24 minutes (with some Bollywood tunes) can burn up to 150 calories. THE DISH: Laddo is a ball-shaped dessert that is made from flour and sugar. They come in different colours, including yellow and orange. CALORIE COUNT: One piece has about 185 calories. BURN IT: Changing your sheets for 30 minutes (maybe for a few beds?) can burn up to 185 calories, according to Quickiechick.com. THE DISH: Ras malai is usually made with powdered milk, eggs and flour, then moulded into balls and served with sugar, cream and milk. CALORIE COUNT: One piece has about 180 calories. BURN IT: Rake for about 30 minutes and spend 15 minutes cleaning up the leaves — you can burn about 200 calories, according to Self.com. THE DISH: Peda is made with thickened milk, sugar and flavourings like pistachios, cardamom and saffron. CALORIE COUNT: One piece has about 100 calories. BURN IT: You'll need a windy day, but flying a kite for 20 minutes can burn 100 calories. THE DISH: Kheer is the South Asian version of rice pudding, made with milk, sugar and toppings like almonds and cashews. CALORIE COUNT: One serving has 270 calories. BURN IT: Running about 10 kms (6 miles) can burn up to 270 calories, according to LiveStrong.com. THE DISH: Kaju katli is made from ground cashews and sugar. The sweet (also called a barfi) is topped with an edible silver foil. CALORIE COUNT: One piece has about 58 calories. BURN IT: Chewing calorie-free gum for four-and-a-half hours can burn 50 calories. THE DISH: Karanji is a dough pastry filled with coconut or sugar and fruit. BURN IT: A combination of steps, toe-taps and mountain climbers for 20 minutes can burn off 225 calories, according to Fitness Magazine. THE DISH: Cham Cham, or Chum Chum, is a popular Bengali dessert made with flour, sugar and coconut flakes. BURN IT: Try boxing! One round of kick boxing (for about 15 minutes) can burn up to 175 calories, according to Fitness Magazine.